Diamond producer De Beers and the South African government have announced plans to create a new, black-controlled diamond mining company. The deal will bring together South Africa's state-run firm Alexkor and De Beers' Namaqualand mining operations. De Beers has been working to meet black economic empowerment rules, and last year sold 26% of its South African business to a black-owned company. The news came as De Beers reported a 6% drop in rough diamond sales in 2006. The firm, which is 45%-owned by mining giant Anglo American, said diamond sales slipped to $6.15bn (£3.16bn) from $6.54 in the previous year, largely because of reduced wholesale supplies from Russia. However, De Beers forecast that increasing demand for diamond jewellery in the emerging economic powerhouses of China and India would help drive future growth. De Beers added that it planned to issue a 20% stake in its Namaqualand mining operations to the government, as part of plans to create the new black-run company. "It is expected that the process of consolidating these assets will be concluded in 2008 and thereafter the option of a listing may be fully examined by the operator of this new company," the firm said. 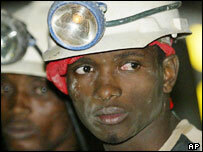 Both De Beers and the South African government are involved in diamond mining along the country's north west coast. De Beers' Namaqualand mines were established in 1928 and currently account for 7% of the total output of the firm's South African operations - De Beers Consolidated Mines.